A spate of deadly avalanches have taken the lives of at least six people in the Pacific Northwest mostly skiing or snowboarding out of bounds near popular ski resorts. One person was killed and another wounded in an avalanche on Mount Herman on Sunday Jan 24, according to the Seattle Times. The skiers had apparently trekked to an out-of-bounds section of the Mt. Baker Ski Resort. While the avalanche danger was reportedly moderate, a persistent slab caused by a layer of frost with added snow has made the situation especially dicey. In late December another man was killed in an avalanche near this area while snowshoeing. Also last Sunday two people were killed that same day in an avalanche just outside the boundary of Jackson Hole Mountain Resort. The area was popular with out-of-bounds skiers even though it was well marked with warning signs. 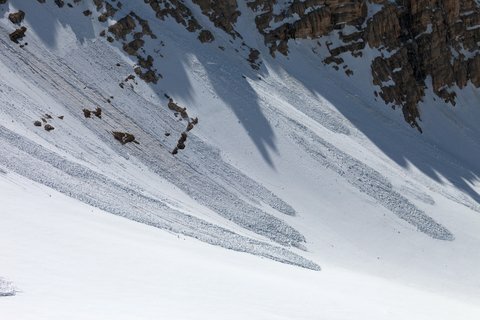 On Thursday Jan 21, two men were killed in an avalanche in the mountains outside Salt Lake City. One of them, Tyson Bradley, was a well-known ski instructor and the author of a Falcon Guide book on back country skiing in Utah, according to the Salt Lake Tribune. Lastly, just a week earlier another ski instructor was killed in Lake Tahoe. The skier was reportedly in an out of bounds area. In an effort to enforce safety rules, officials at Sugar Bowl Resort, where the accident happened, said they would prosecute a snowboarder who posted a video of an avalanche in an out-of-bounds area of the resort to Youtube.